This one-day program is certified through the Canada Safety Council. This training program, intended for ATV riders over the age of 14, combines classroom and practical training components. Participants, whether riding an ATV for business or pleasure, can benefit greatly by learning key operational skills for safe and efficient use. There is a separate program for individuals under the age of 14 who obtain written consent from a parent or legal guardian. 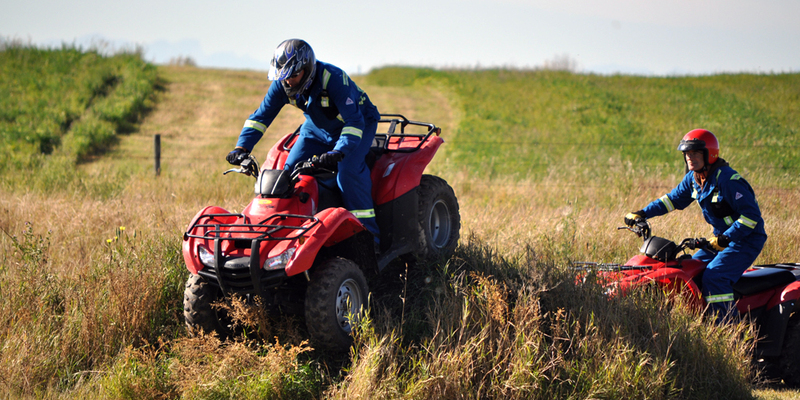 Identify and manage risks associated to ATV usage. Identify all components for pre-use inspections of an ATV. Locate and operate controls on an ATV. Demonstrate the correct technique for shifting gears. Apply the SIPDE (Scan/Search; Identify, Predict, Decide, Execute) strategy of risk reduction and management. Demonstrate turning skills through body position, weight transfer and speed control for slow and sharp turns. Demonstrate emergency stops and turns. Demonstrate riding over an obstacle which can not be avoided. Identify safe riding practices and environmental concerns. Operating on hills and changing terrain. Loading/unloading of an ATV from a carrier.